When CyberFace had been left dangerously unstable after his first resurrection, Abner Cadaver sought a means to extend his life. An army of the Undead were summoned to Chicago so that the Vicious Circle could search for an answer to the problem. 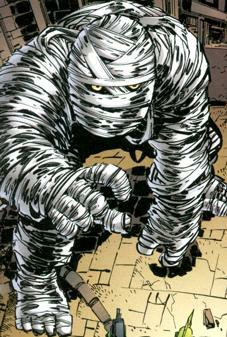 The Big Mummy was one such creature who ended up fighting both Dragon and a visiting Hellboy, the two heroes causing him to depart. Some time later, the Big Mummy was transported to the small European nation of Lieberheim by its ruler, Dread Knight. The desperate dictator was searching for a means to gain immortality and the Big Mummy’s status meant that he served as an avenue of scientific exploration. The Big Mummy battled Zeek during this encounter and proved itself to be incredibly powerful in order to hold its own against such a powerhouse.